Edgenuity announced today that Phoenix Union High School District has selected it as the district's primary online and blended learning solution. 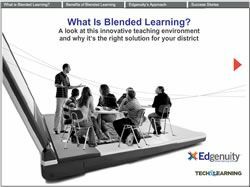 Beginning in the 2015-2016 school year, Edgenuity will provide access to its full curriculum and offer Blended Learning and Blended Learning Services to the district’s 16 schools and over 27,000 students. Phoenix Union selected Edgenuity because of the rigor of the content, differentiated training for teachers, and student tools embedded within the curriculum.